Ginger and turmeric are two powerful spices that have been used widely throughout history for both culinary and medical purposes. Using these spices in recipes provides a way to season a variety of foods without adding sodium or fat. As supplements, ginger has been frequently used in traditional and herbal medicines and turmeric has long been used to treat various physical ailments, according to the University of Maryland Medical Center. Although they are used in many different types of cuisines for their spice and flavor, these spices may also provide a number of health benefits. Ginger and turmeric are both rhizomes in the Zingiberaceae family. According to a 1999 study published in the "British Journal of Cancer" by researchers at the Forest Research Institute of Malaysia, extracts of ginger and turmeric have been found to inhibit the growth of cancerous tumors. In this study of human cancer cells, turmeric was found to completely inhibit further growth of cancer cells. 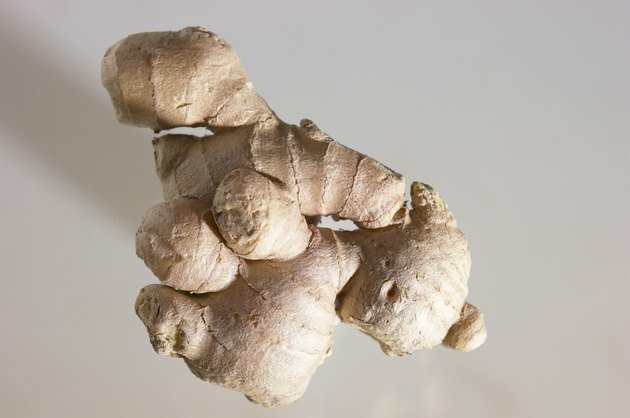 Ginger was also found to inhibit tumor growth. In 2006, an additional study by researchers at the University of Michigan Comprehensive Cancer Center showed that ginger has further benefits for women suffering from ovarian cancer, as it kills ovarian cancer cells. Turmeric and ginger both have antioxidant properties that contribute to their ability to help to prevent cancer. Both ginger and turmeric have anti-inflammatory properties. Turmeric is widely used in Ayurvedic and traditional medicines to treat inflammation. According to the University of Maryland Medical Center, one study showed that a mixture of Ayurvedic herbs and turmeric decreased inflammation in people suffering from osteoarthritis, although it's unclear as to whether it was turmeric that resulted in the lowered inflammatory response. Ginger is also used to decrease inflammation in traditional and herbal medicines. Health care professionals often use ginger to treat inflammatory conditions such as arthritis and ulcerative colitis, according to the University of Maryland Medical Center. Turmeric and ginger are used to treat different forms of stomach and digestion-related issues. Ginger has been shown to be effective at reducing symptoms of nausea and vomiting related to chemotherapy. The University of Maryland Medical Center points to ginger's effectiveness at reducing nausea and vomiting from motion sickness. Turmeric may help reduce symptoms of indigestion, such as bloating and gas, according to the University of Maryland Medical Center.